Hythe Pier Railway is the oldest pier railway in continuous use in the world. Hythe is an ancient settlement situated on the west shore of Southampton Water. It is the perfect spot from which to watch the large cruise liners and container ships pass up the channel, to the docks and cruise liner terminals of Southampton. 19th Century Hythe Pier reaching out into Southampton Water. Ride the Hythe Ferry across Southampton Water. The electric train conveys passengers to the ferry. The iron pier carries the train over 600m to the ferry. Hythe Pier train leaves the station. Hythe a lovely place to explore before riding the ferry. Hythe looking towards Southampton docks. Connecting with the ferry at Hythe Pier. An important part of transport history in England. The stretch of water into which the Rivers Test, Itchen and Hamble empty, has been an incredibly important waterway, for well over a thousand years. Those wishing to trade with or plunder from, the English, made their way up the sheltered estuary and escaping up the rivers, could easily pass into the heart of Hampshire. It is not surprising therefore, that anywhere on the shore line that could provide an easy landing place, would be recognized and exploited. Hythe was this place. The people who lived here were connected to the water in all ways. There has been a ferry here for at least five hundred years, connecting the New Forest with Netley and Southampton. There were boat building yards along the shore and Hythe men acted as lightermen when cargo vessels became too large to get to the quayside to unload. It must have been such a busy stretch of water and the settlement of Hythe thrived through these busy times. The Victorians greatly enjoyed pier building. In 1870, it was proposed that the Hythe ferry would serve its passengers better, if it did not require them to walk out onto a gravel hard, that was difficult to navigate and frequently resulted in the ferry passenger getting very wet feet. It took another eight years before the pier was finally built. The iron pier is 640m in length and such was its success, that in 1909, tracks were laid to carry passenger’s baggage to the ferry. The trolleys were moved along the track by hand but in 1922 a narrow gauge electric railway was opened and this conveyed passengers along the full length of the pier, adding to the excitement of the whole event. This railway with its original engine and rolling stock is still in operation, making it the oldest pier railway in continuous operation in the world today. The pier has been altered and overhauled during its many years of service. In 1894, Hythe Sailing Club built its clubhouse at the pier head, a perfect place from which to watch the steam ships passing out of Southampton. 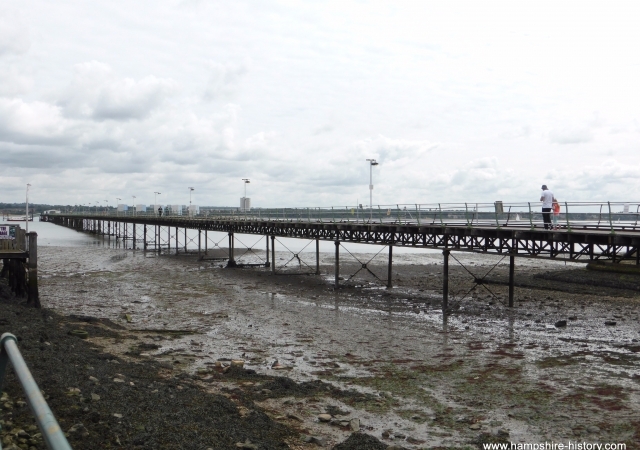 If you stand at the pier and look across the water, Netley Castle and the remains of Netley Abbey, the Cistercian abbey founded in 1239, are visible. Further along is the Royal Victoria Country Park where the vast Royal Victoria Hospital once cared for so many casualties of war. Find out more by visiting the Transport Heritage site or book a ticket form the Hythe Ferry station.